Bridge Tallies - Avonmore, Inc.
Progressive movements appear on reverse sides of 2&3 and 4&5 table bridge tallies. Washable pens can be used to write directly on tallies, but players generally prefer to attach adhesive notes for score keeping. Each set also includes table number markers and a 50-sheet pad of notes. 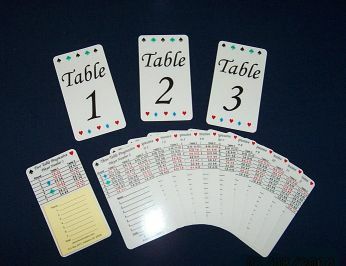 Movement for Pairs: The 2-table movement can be used for mixed pairs through the first four rounds; for instance, women draw even numbers and men draw odd numbers. The 3-table movement can be used for mixed pairs through the first six rounds. The 4&5 table movements can be used for mixed pairs through seven rounds. Tallies are reusable and will last for years with proper care. Do not submerge in water. 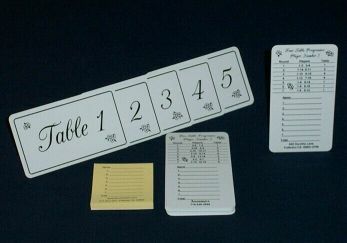 The 2&3 table tallies are laminated and have the Smart Colors design to match the playing cards. The 4&5 table tallies are printed on plastic in black and white. Each tally set includes one note pad of 50 sheets. Many customers order additional note pads.